I have never been in court except to plead guilty. Between the American Civil War and the introduction of the Linotype machine in the 1890s, a curious sub-species of Homo Sapien roamed the mountains and prairies, dusty trails and roads to nowhere and everywhere throughout the United States. Escaping heartbreak, following the next drink, deserting the Army, coping with war trauma, fleeing debts, the wages of vice, the humiliation of typographical errors, or simply heeding the call of the wild, tramp printers populated the landscape. Most were well-educated, many came from respectable families. What they all had in common was that when urge struck or circumstance befell they resigned their position, collected their pay and hit the road. What Alastair M. Johnston, editor of Typographical Tourists: Tales of the Tramping Printer, a new book from Johnston's Berkeley-based Poltroon Press, has done is a fascinating joy, pulling out of the oven a fine loaf of printing history, rich and nourishing, previously sliced but never so generously nor spread with such tasty condiments and wry wit. The condiments have tang. Employing “artistic printing” ornaments from the 1880s, Johnston used all the Victorian typefaces in his shop for headpieces and a fair amount of “clip art” - small news cuts from the specimen books of the late nineteenth century to evoke the period. Morningstar, a serial prankster who, left alone to compose, would write and print announcements and advertisements of unusual candor: "Now is the time to die. Perkins is giving cut price funerals and will bury people at bargain prices..."; Beanbody, a gifted forger of letters of recommendation from former employers he'd burned; Rocky Mountain Smith (or was it Jones? ); Texas Jack, who "wore a sombrero, top boots, and a long linen duster" and was the fastest setter in the West; "Shortalize" Murray, who employed abbreviations uniquely his own; Alexander Cameron, a Scotsman who, after incurring the wrath of his boss and being fired continued to show up for work anyway, his employer ultimately capitulating to his charm; Old Barney, who thus explained his chronic homelessness: "my blood is too quick...It would be impossible for me to settle down...prosperity would wear me out...Three meals a day and a place to sleep [would] eventually kill me;" and Thomas McKenna, "reputed to be one of the oldest printers in the country. He was old when the oldest printers on the Eagle were kids, and there is a legend about him to the effect that he was seen around the office when Gutenberg and Faust were making their first experiments with movable types." "The old-time tramp printer was generally 'an amoosing cuss,' as Artemus Ward would say." Many tramp printers, as Ward, became writers, and we learn that some "set their matter 'right outer their heads,'" avoiding pen and paper altogether, a mind-boggling process to contemplate. Walt Whitman, William Dean Howells, and Horace Greeley were tramp printers in their youth, as was Lincoln's favorite author, political humorist Rev. Petroleum Vesuvius Nasby. You'll also get to know Mark Twain (“as a typesetter he was slower than the wrath of God”) and Bret Harte, who, it was reported in 1876, "admits that he learned the printer's trade. He says he could work six quarts of type per day on a hand-press, and could correct a roller as good as anybody." And what of the female compositor? "They never 'sojer,' they never bother the editors for chewing tobacco; they never prowl around among the exchanges for The Police Gazette; they never get themselves full of budge...they never swear about the business manager, they do not smoke nasty old clay pipes..." That's why the lady is not a tramp. Only problem? Entering the trade by necessity, single women tended to depress wages. The solution? "Select a pretty, modest and amiable compositress, and take her out of the printing office by marrying her. If you cannot do this, because you already have a wife, encourage others to do it." What inspired Johnston, a master printer who has managed to stay in one place, to take up the hobo's bindle and stick and bum the scholar's road? "...Soon I had two folders of raw material and decided it was time to put the material in order before it got too unwieldy. But then I discovered the Library of Congress Historic American Newspaper archive which yielded many more wonderful tales tucked between ads for shoe polish and draught horses. I was overwhelmed with great source material and could cherry-pick it for this anthology, tailoring it so the stories lead into one another." Typographical Tourists is an extremely colorful, often wildly amusing, ink-stained On the Road, with Johnston steering us through the world of printers with type in their blood but ants in their pants, compelled by personal demons or nomadic spirits to a precarious existence leavened by an adventurous, if impecunious, black-ink life rich in colorful anecdotes and stories. Johnston has performed a fine service by collecting them here in one place from diverse sources, known, obscure, or merely forgotten. It's a movable type feast, accent on the movable, a travelogue through the peripatetic world of the tramp printer. JOHNSTON, Alastair M. (editor). 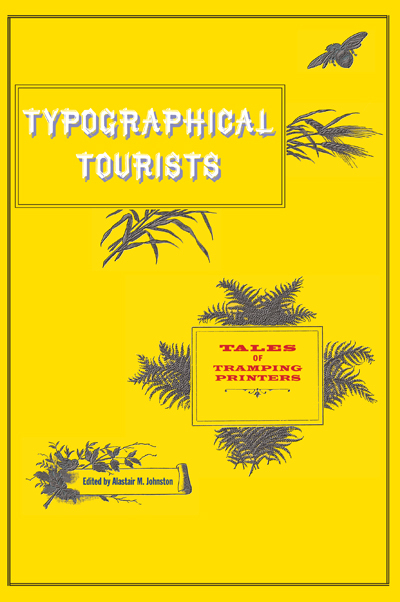 Typographical Tourists. Tales of Tramping Printers. Berkeley: Poltroon Press, 2012. Octavo. 178 pp, including bibliography. Illustrated wrappers. $20. I look forward to reading these tales. As much as I love Victorian typography and clip art, I was unaware of tramping printers. It is interesting to note that in "How Women Can Make Money, Married or Single", by Miss Virginia Penny, 1870, that the Printers' Unions in the United States had actively prevented women from entering the occupation of printer, due to the reasons regarding wages mentioned above, while pointing out that women, with their "fineness of touch and quickness of motion" made them a good fit for the occupation. The book goes on to recommend that more men enter into agriculture.